During the Cocktail Blogger Barhop 3, bar owner Aidan Demarest mentioned he was headed to Aspen, Colorado for a cocktail fest. My ears perked up. 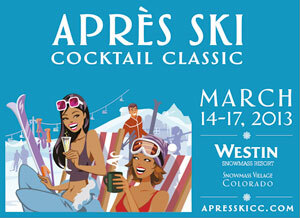 Sure enough, on March 14-17, 2013, Aspen will hold their first annual Après-Ski Cocktail Classic. With a motto like this: “Drink Well, Laugh Often, Ski Much”, it sounds like a fabulous way to spend a weekend, especially with all the fresh powder of last week’s crazy storms. And there’s no better place to hold the first skiing-cocktail festival than in Colorado’s oh-so-chic town of Aspen: ShermanTravel.com just ranked it as the #1 Après-Ski destination. 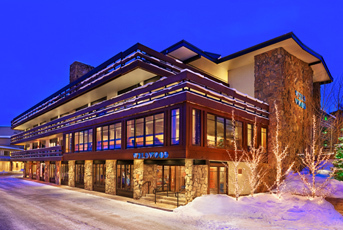 Headquartered at the new Westin & Wildwood Snowmass Resorts, it’s four days of seminars, cocktail competitions, bourbon, scotch and cognac tastings held fireside and of course, plenty of cocktail- making classes from master mixologists on classic après-ski drinks like Irish coffee and hot toddies. The under-21 set can participate in the Craft of Making Hot Chocolate (with a few tips for adults on how best to spike it). At the Grand Tasting Village, guests will receive their own snifter glass for sipping cognac, in between sampling a treasure-trove of rare and premium spirits, champagnes and toddies. Interspersed with all those heady offerings will be artisanal sodas, fine chocolates, alpine classics like cheese fondue and raclette, and other small bites. A VIP Grand Reserve Tasting room will offer participants afternoon-long grand tastings of reserve spirits, liqueurs and champagnes. 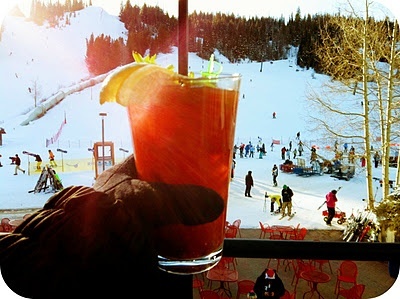 Skiers and non-skiers alike will find another way to imbibe or simply start the day on a healthy note, with pre-ski pop-up bars serving creatively-spiced Bloody Mary’s, Mimosas and Bellinis, juices, smoothies and gourmet hot chocolate. Ticket prices range from $31 – $365 (VIP 4-day all access). NBC News’ 8 Great Après-Ski Cocktails and where to find them. Top photo by Flickr user Changma, Hotel photo courtesy of Westin.